Lzip is a Windows utility that enables you to apply lossless compression to files, in order to reduce the size of data as much as possible without sacrificing quality. 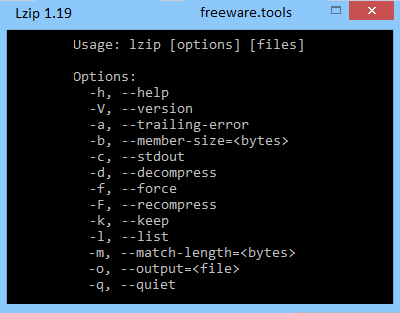 Lzip is a lossless data compressor with a user interface similar to the one of gzip or bzip2. Lzip can compress about as fast as gzip (lzip -0), or compress most files more than bzip2 (lzip -9). Decompression speed is intermediate between gzip and bzip2. Lzip is better than gzip and bzip2 from a data recovery perspective. In other words and simply stated, this tool allows you to compress data to LZIP format for long-term archive storage and data sharing using this command-line application with many configuration settings. The program has an interface similar to gzip and bzip2. It gives you the possibility to limit the dictionary and volume size, test the integrity of archives to make sure that no errors occurred during compression, apply verbosity, as well as pick the level of compression, whether you want to favor minimal file size or best compression speed. It's not necessary to go through an installation operation since you can just unpack the downloaded files and run them from the console environment. A list of all commands can be displayed on the screen by writing --help. The usage is lzip [options] [files]. As far as options are concerned, you can set the member size limit in bytes (-b), allow the tool to overwrite any existing output files (-f), force the recompression of already compressed files (-F), and prevent the program from automatically deleting the source files after successfully compressing them (-k). It's also possible to display the sizes of the compressed or uncompressed files (-l), specify the match length limit in bytes (-m), suppress all messages in the console interface (-q), indicate the dictionary size limit in bytes (-s), and point out the volume size limit in bytes (-S). The integrity of the compressed files can be checked (-t), and you can also apply verbosity (-v) and set the compression level to any level between 0 (fast) and best (9, default is 6). Although it is not common among casual users, LZIP is a file format recommended for generating archives with a small size, for long-term purposes, as well as for sharing large amounts of information. This utility carried out compression and decompression jobs quickly in our tests while remaining light on system resources usage. It worked smoothly on Windows 10. All aspects considered, Lzip offers a simple solution for swiftly creating LZIP archives and configuring settings from the command-line interface.